Don Boscos work for boys started with one boy, a masons apprentice. Soon this boy brought others and the number of Don Boscos friends multiplied. He gave them facilities for games and taught them their religion. Don Bosco called his method of education the Preventive System, based on REASON, RELIGION and KINDNESS. He told his disciples that education was to be based on love, on selfless service for the mental, emotional, moral and spiritual growth of the pupils. 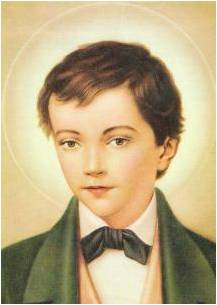 Dominic Savio (Italian: Domenico Savio; April 2, 1842 – March 9, 1857) was an Italian adolescent student of Saint John Bosco. He was in the boarding house of Don Bosco when he became ill and died at the age of 14. His teacher, John Bosco, had very high regard for Savio, and wrote a biography of his young student, The Life of Dominic Savio. This volume, along with other accounts of him, were critical factors in his cause for sainthood. Despite the fact that many people considered him to have died at too young an age – fourteen – to be considered for sainthood, he was considered eligible for such singular honour on the basis of his having displayed "heroic virtue" in his everyday life.He is the only saint of his age group, which includes Maria Goretti (age 11) and Ponticus of Lyons (age 15),who was declared to be a saint not on the basis of his having been a martyr, but on the basis of having lived what was seen as a holy life. He was canonised a Saint on June 12, 1954 by Pope Pius XII, making him the youngest non-martyr to be canonised in the Catholic Church.